The new year will mark a half-century since a "seismic" shift in geology unfolded. Eldridge Moores was a key thinker in that shift. He died in late October, but the longtime UC Davis professor and field researcher left a permanent mark on geology and a gaping hole in the hearts of those who admired him. Moores was known as a man of the field but one of my most indelible memories of Eldridge was in his living room in Davis. Here was this near-octogenarian crawling around on all fours, unrolling giant geological maps, slipping off his shoes to weigh down the corners, then pointing out with obvious enthusiasm that the blue areas were rocks as much as 500 million years old -- the oldest rocks in the Sierra Nevada. I got another dose of that enduring youthfulness two years ago, chasing after him as he led me -- at a brisk pace -- down to the Yuba River bank. We were in search of the kind of “incompetent” rock that contributed to the catastrophic collapse of two spillways at Oroville Dam. "You can just dig it," he said, as he hammered away at a patch of rusty-brown, flaky stone. "It’s on its way to becoming dirt." It turns out that weathered rock and rushing water are a poor combination for keeping dams in place. 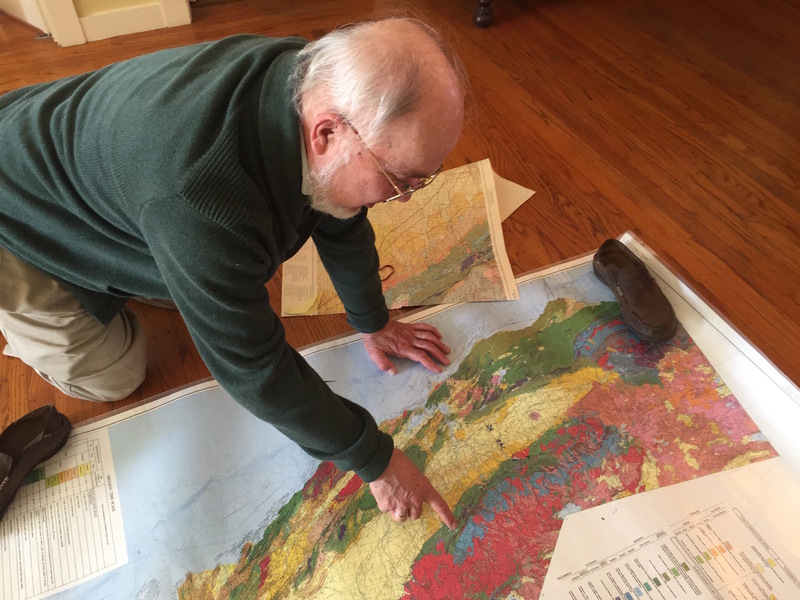 Apart from his boundless energy, Moores' real gift was his vision: his ability to "see" geologic history in a pile of rocks. He was one of the first to look at a jumble of stone and see in that the literal construction of the Sierra Nevada -- the forces that made these mountains over hundreds of millions of years. Twenty-five years ago, author John McPhee trailed Moores around the Sierra for his book "Assembling California." In it, Moores reveals how the Sierra Nevada range didn’t just pop up from the Earth’s crust, as geologists long thought; rather, the building blocks bubbled up from faraway rifts in the ocean floor called “spreading centers," then transported thousands of miles on moving plates and piled up onto the North American continent. In March of last year, Moores and I drove into the foothills of Yuba County, where the whole process is laid bare in road cuts along Highway 20. Moores would pull over and dodge the trucks roaring by to show me smooth, black, ocean remnants called pillow lavas bulging from the hillsides, and vertical layers of "sheeted dikes" striping the rock face. Moores is the one who decoded all this. "It’s a forensic exercise," he explained. "You’re dealing with an experiment which you didn’t design and is still going on. And you have no eyewitnesses to the processes when they went on 160 million years ago." While the notion had already been around for a century, the concept of plate tectonics was still a tough sell when Moores began his career in the 1950s. "Oh, there was lots of resistance," Moores recalled. In 1969, Neil Armstrong hopped down from his lunar module and declared a "giant leap for mankind." Later that year, a lesser-known leap occurred when geologists gathered at Pacific Grove's Asilomar conference center. At Asilomar, scientists began to unpack the mechanics of plate tectonics, the idea that the Earth’s crust is constantly moving, kind of floating around on a molten sea, miles below the surface. "It was a very exciting time. I still get goosebumps even talking about it," Moores recalled for me in 2017. "A turning point, I think it was, in the plate tectonic revolution, that was the watershed of geology." That “watershed” now informs much of what we know about earthquakes, volcanoes, and how today's continents were formed. 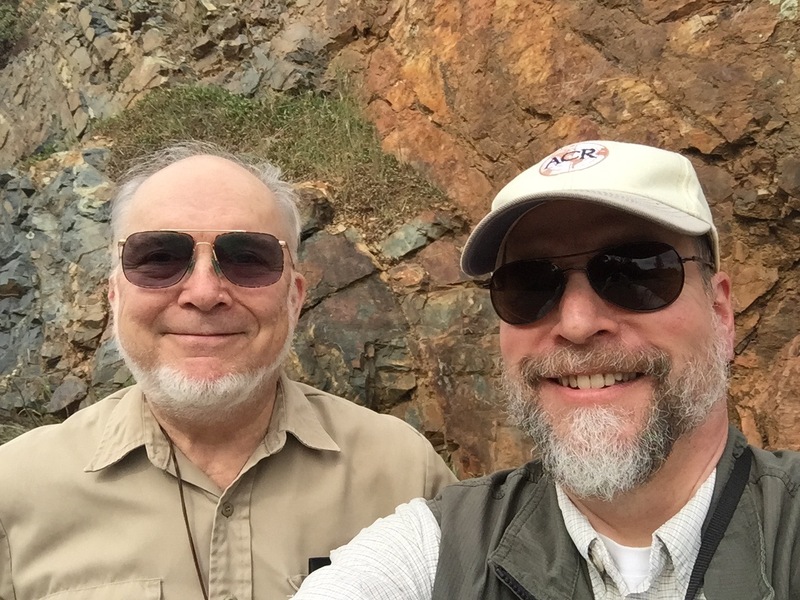 Moores would eventually compile an eye-popping resumé: editor of Geology magazine by the 1980s, head of the Geological Society of America in the '90s, and recipient of numerous awards, though some of his early work on tectonics wasn't universally embraced. "That didn’t exactly win over anybody very quickly," Moores recalled, about an early paper he wrote during that time. "In fact, some people published an article saying, ‘We see no need for this.’ But they were wrong, I think." In fact, the whole idea of continental drift -- that there was one enormous “supercontinent” called Pangea before it broke apart into the half-dozen we know today -- got a major boost from Moores’ work. 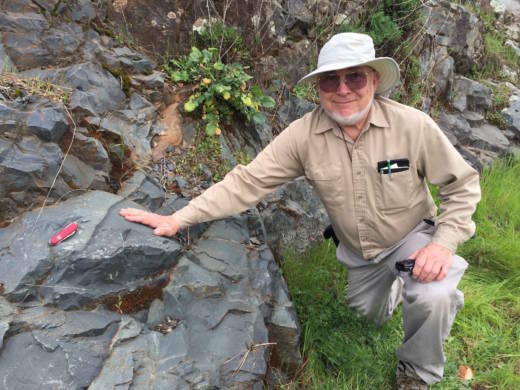 Michael Oskin, who fills Moore's old seat as chair of the UC Davis geology department, says it was Moores who discovered that rocks in Antarctica were identical to some in the southwestern U.S. That led to defining an even earlier mass, now called Rodinia, that broke up about 700 million years ago and reformed as Pangea. "There’s an old saying that every scientific truth goes through three stages," he told me. "First people say it conflicts with the Bible, [by which he meant conventional scientific views], and then they say it’s been discovered before, and finally they say they always knew it." Moores once told McPhee that he saw his work not as a solo but an orchestral piece. At a packed memorial service in November, friends and colleagues called him a “Renaissance man.” True enough: his work on the forces below us earned him a permanent place in the geological renaissance. "I had all this in my head, and I was so excited at the end of that period, I could not stand still," he told me. Eldridge Moores never really could stand still. He died in late October, while leading a group into the Sierra, sharing his vast knowledge and boundless enthusiasm for his rocks, one last time.